Over the past months you may have noticed some appearance problems at our blog-site. These were caused by software incompatibilities with the widgets. Today I changed WordPress themes in order to fix those problems. Everything other than the look should be the same. All previous blog posts, comments, media, and site contents are retained. If you run into any problems, please let me know. 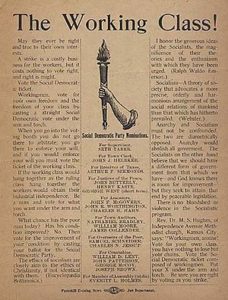 I came across this pictue that I thought was interesting. It shows our torch logo as it originally appeared. 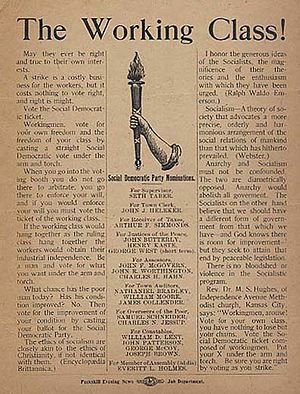 This is a flyer for the Social Democratic Party in Peekskill, New York in 1900. Compare it to our current logo on our home page. And finally, a reminder that Subscribe and Unsubscribe functions are User-Controlled on our home page in the right hand column. I like this “modified look” much better; its more pleasant to the eye. Ditto! What’s the theme? Nice clean lines. Looking forward to reading more. Did Green spoiler toss Arizona senate race to Republicans? Hate Crime Visits Pittsburgh, again. SDUSA is Proud to Endorse The Congressional Candidacy of Jeff Ballinger, our former Executive Director, in the Sept. 4th Democratic Primary in Massachusetts 3rd Congressional District.